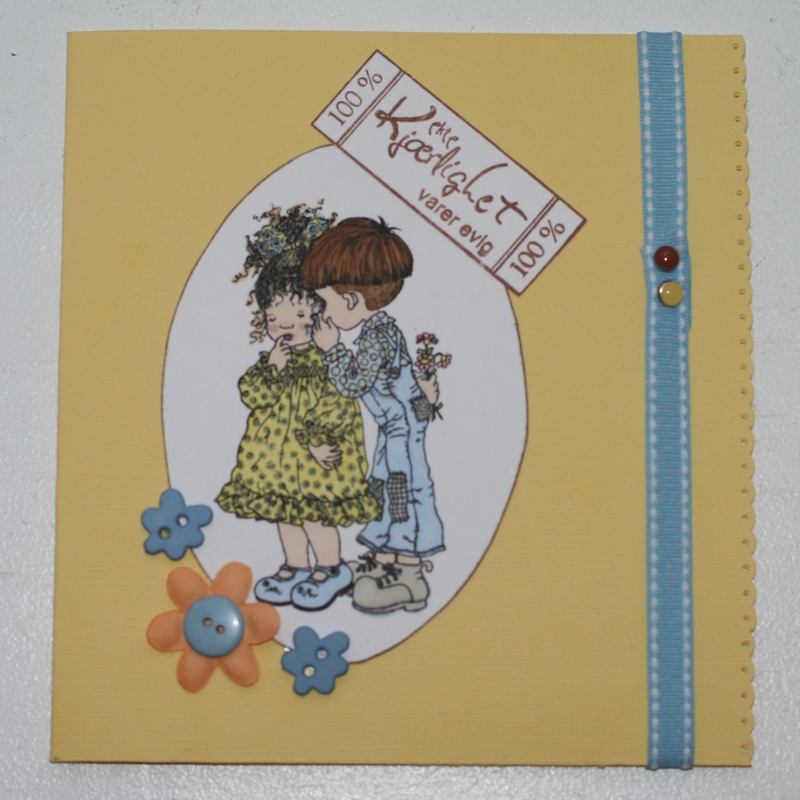 Today I’ve made a new wedding card. And sort of by accident, it didn’t turn out pink. I wanted to test out a new rubber stamp and some of the new Promaker pens I bought yesteday. So I started with the color yellow and followed up by the color blue; not really thinking it’s not standard wedding colors. When I had finsihed coloring the picture my instant thought was ‘the dress is not pink!’ But it didn’t take long before I made up my mind and decided not to care. A wedding card doesn’t always have to be white and pink, does it? I think not. What do you think? I ended up going for a yellow/blue theme with a hint of brown. The text says ‘real love last forever’. I decided to decorate an envolope as well. And I went for the same color-theme, yellow/blue. 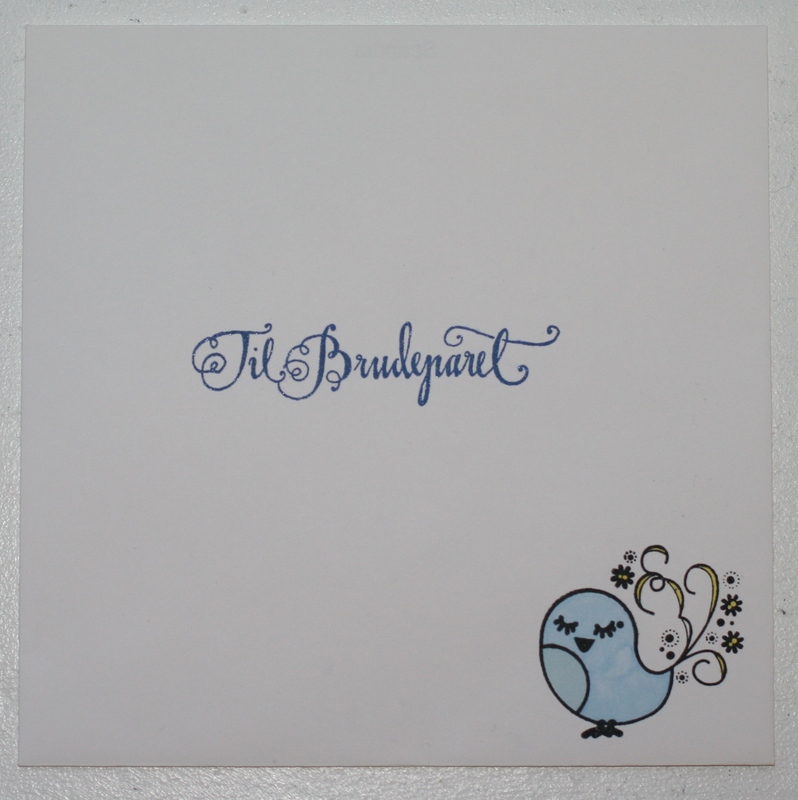 The text says ‘to the wedding couple’ The bird-stamp is new. When I saw it in the store yesterday, I knew that it would look smashing on envolopes. It’s a pretty bird and so is the flowers and ornaments. Now I’m inspired to do another wedding card. First I think I have to clean up a bit in my scrapping mess. The dining table is completely covered and things are a bit messy.